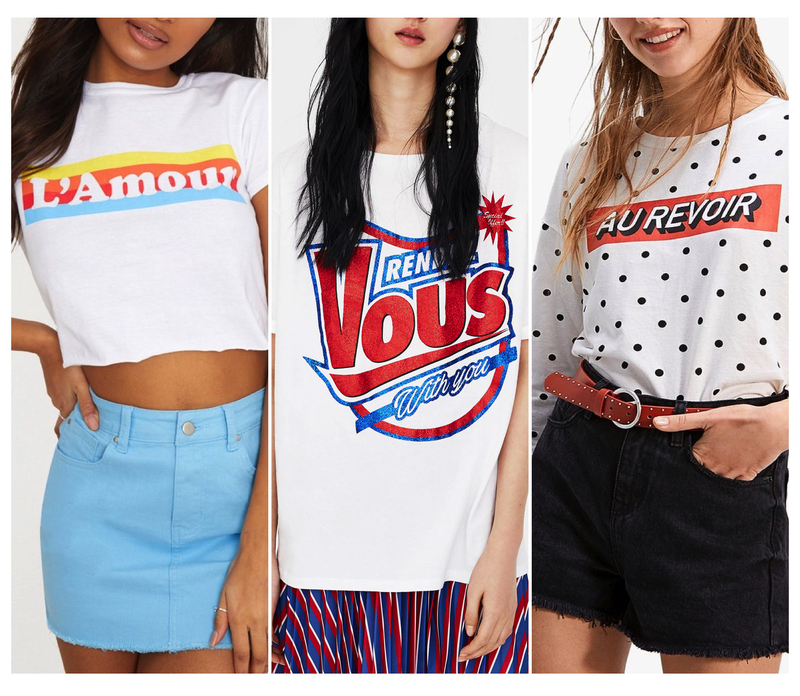 I am so glad slogan tees are back with a bang. They're just such an effortlessly cool piece to throw on over a pair of Mom jeans or a leather-look skirt; and as they're only a t-shirt so they don't break the bank either! There are so many different options too depending on how sassy you're feeling. River Island are absolutely killing it in the slogan/graphic top department right now, so you'll see a few options from them in this post. Shop their tops here. Handwritten, script-style tees are the perfect way to do slogans, whilst still keeping it girlie. I love the metallic detail on this River Island Future of Fashion tee, plus green is a really key colour for Spring. If you love clashing colours, this Heartbreaker Club tee from Motel Rocks is a great option; the pink and red make sure a cute combo! I'm all about wearing a tshirt that reflects my mood so this It's All Good tee is right up my street. Perfect for those days when you're feeling chill AF and want everyone to know it. I don't know who decided to start writing slogans en Français on our clothes, but whoever it was, well, merci. French is such a beautiful language, so why not wear it? It makes the simplest word like 'goodbye' into a far sassier statement, like on this adorable dotty number from Stradivarius. For that casual (but still cute) vibe, this cropped L'Amour tee from Pretty Little Thing is a great choice. Very 'That 70's Show'. (14 year old Mila Kunis would be so proud.) I'm also completely obsessed with how over the top glittery this Rendez Vous oversized top is from Pull and Bear. What better place to make a statement than on a statement tee? 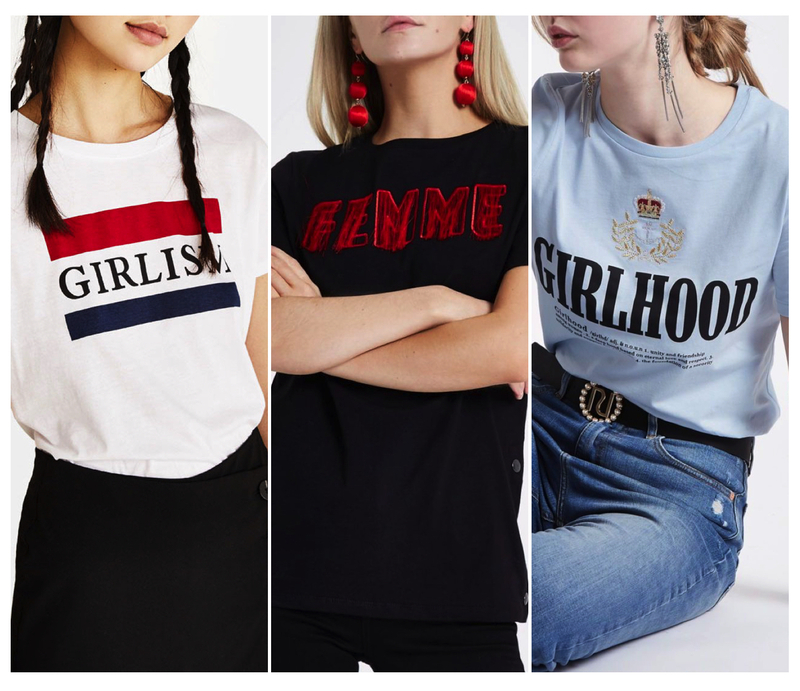 2018 has already seen so many amazing and powerful women stand up for what they believe in with campaigns like #MeToo and #Time'sUp, so it's great to see fashion brands are bringing out Pro-Woman tshirts like the ones above. The Girlism flag top is a really clean and simple option, plus Bershka grow their cotton ecologically which is amazing! I love the boldness of this Femme tee from River Island, and could easily see it being paired with a killer blazer and some printed boots - very Girlboss. Also how cute is the crest embroidery on this RI Girlhood tee? So fetch. Are you feeling the Slogan Tshirt trend? Or is it not your thing? Let me know in the comments below! Regardless, I hope you all enjoyed this post; do let me know if there's a trend or topic you want me to feature next time! 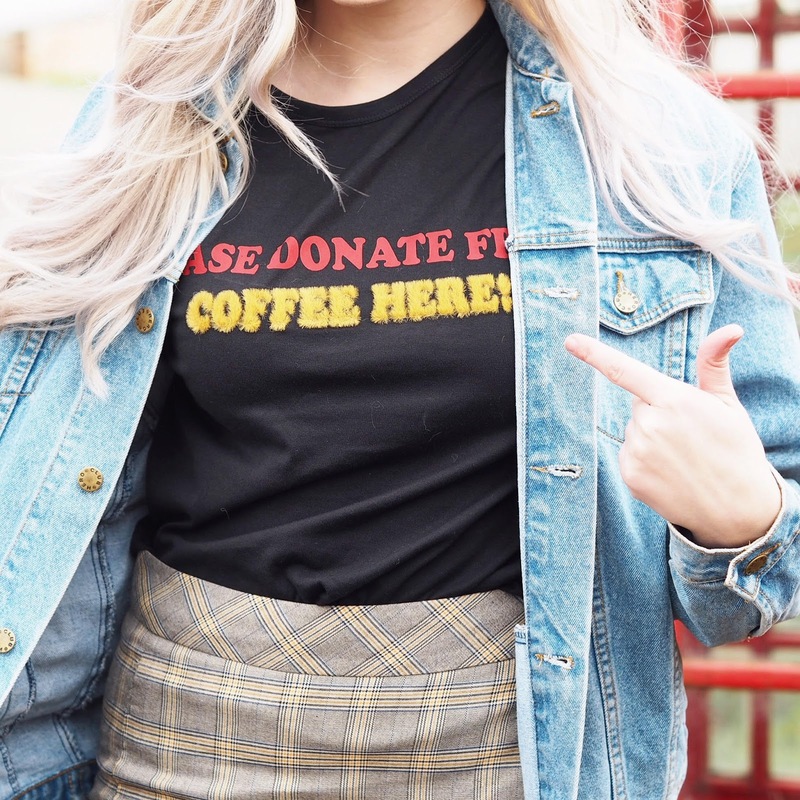 Oh my goodness I am loving Slogan tees too! 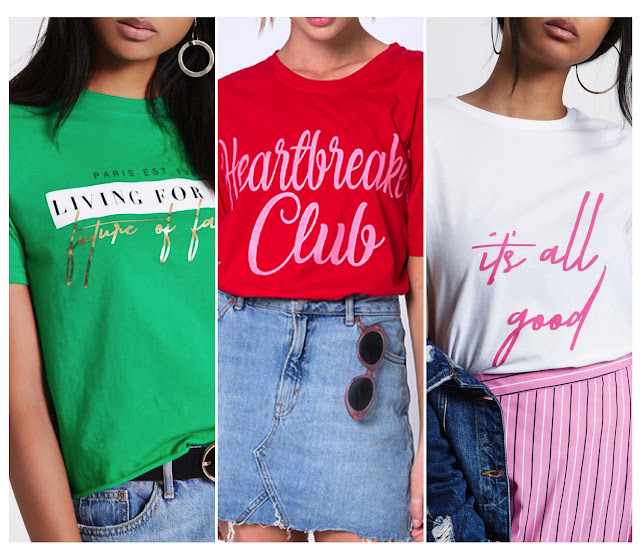 River Island are KILLING it at the moment, I love their tees and I'm also loving their trousers, I had a huge haul a few weeks ago and I loved everything I bought! 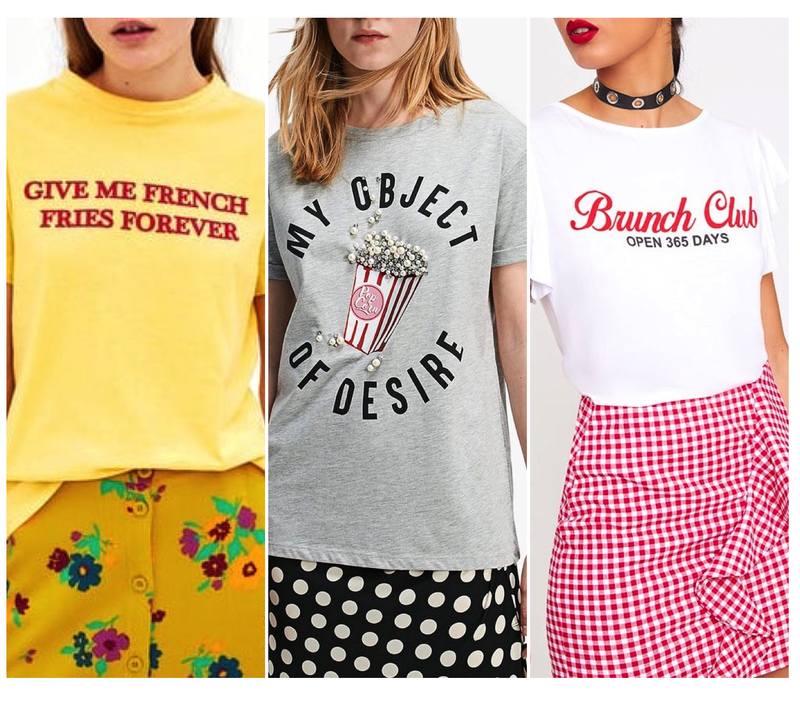 I think slogan tees are so good because you can dress them up or down, which I'm deffo always for! The first row are definitely my favourites! Would you believe that I'm actually sitting here in my GRL PWR t-shirt as I comment on this?! I'm a big slogan tee lover, anything that adds a bit of sass to an outfit is a winner in my opinion! I haven't actually shopped at River Island in yonks so I will have to stop by when I'm next in town to see what they've got on offer - I may have to follow your lead and invest in a few more cute slogan tees!